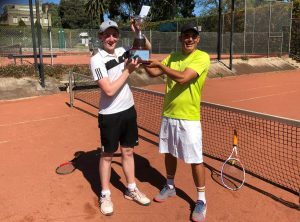 Congratulations to Sam Cohen and Dylan Edgley for a great win (0/6, 6/4, 7/5) to take home the 2018 Keith Young Trophy (and a $100 gift voucher). Sam and Dylan faced Willy and Rod, the defending champs. Will and Rod took the first set, but Sam and Dylan took the second set in an arm wrestle and eventually steadied to eventually win the match. Overall, a great game of tennis. 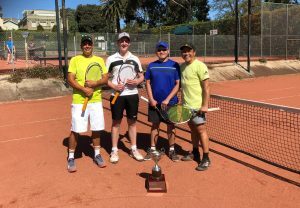 The 2nd match, the Men’s Singles Final between Tom and Rod, unfortunately had to be postponed to Saturday, 17/11, at 1:30pm. All are welcome to watch! We will have a BBQ (hosted by Pierre of course) – and BYO drinks!!!! Bing – hope you can make it again! Thanks for being the Match Official for the game!